As promised, I tried a recipe. I started with your latest entry for dinner tonight. We were planning on having a rotisserie chicken so I thought the soup would be a good starter. 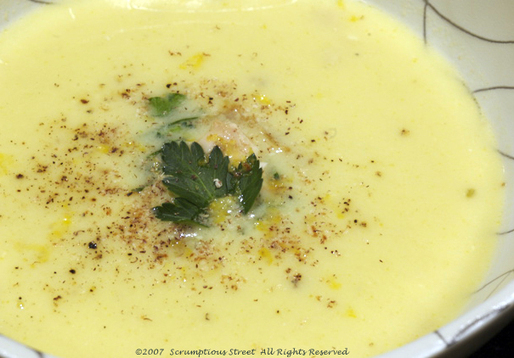 I wasn't sure how the family would feel about lemon in soup, but I gave it a shot. Mr. Scrumptious' childhood memory was a success. My wife loves chicken soup (especially with chicken and rice in it) and she said this was very good and she enjoyed it very much. My daughter was equally satisfied which surprised me a little since she is a somewhat fussy 20 year old. So I want to thank you for your contribution. Larry, Welcome to Scrumptious Street! I'm so happy your family all liked the soup, it really is delicious and comforting, isn't it? It's my pleasure, making and posting these. I hope you'll find many more that will work for your family. PS you should enter this into soup's on! hold on, let me find the link. Yvo, I am glad BF will eat it because it's really good. Yep, no milk dairy, only egg yolks. I love the nutmeg, but it's one of my favorite spices. You'll notice there really is no other spice so a large part of the flavor comes from the nutmeg. I'd leave it in if you can. Thanks for the idea on entering, I'll check it out!